This stylish ion plated bracelet watch from Hugo is timepiece of choice for the fashionable modern man. Featuring a sophisticated cool tone grey minimal dial and boasting three sub-dials. This watch has an unmatchable unique style, and is the perfect watch to take you from day to night. 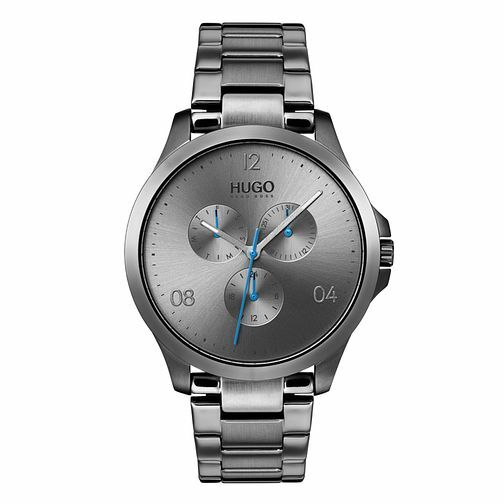 Hugo Grey IP Grey Dial Bracelet Watch is rated 5.0 out of 5 by 1. Rated 5 out of 5 by Anonymous from Excellent watch This is a fantastic watch, looks incredible, reasonably priced, Emily in the Guildford branch did an amazing job, highly recommended!